Find a collection of pictures of the event in the Gallery, at the following link. Venue: Lecture Hall 31, Engineering Building 3, Hongo Campus, The University of Tokyo. The theme of the symposium is Constructive Developmental Science, which aims at understanding human cognition by means of interdisciplinary approach (e.g., psychology, cognitive science, neuroscience, and robotics). 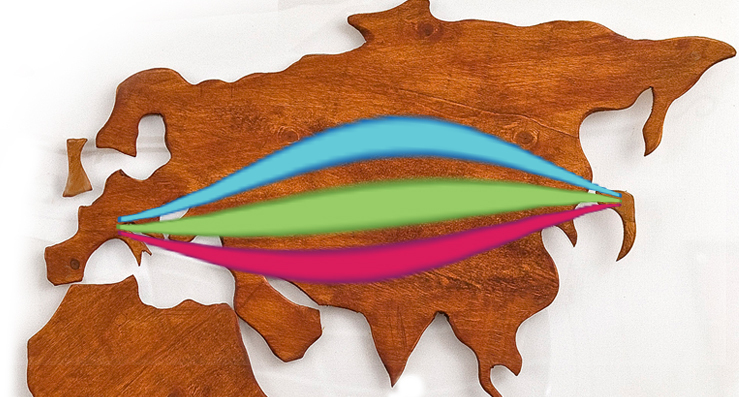 We will have world-leading researchers from different disciplines as invited speakers. In particular, this symposium intends to present the international Core2Core-CODEFROR collaboration as well as latest achievements of Osaka local projects. Until 30 November it is also possible to submit a poster for the dedicated Poster Session. Location: Genoa, Italy, Munizioniere (Palazzo Ducale). The exhibit consists of a series of interactive experiences focused on communication through vision, audition and touch. Through the activities participants of all ages will learn the limitations and the potentialities of the different sensory modalities in supporting social communication. One goal of the exhibit will be also rising awareness about the difficulties in communication faced by people with sensory disabilities. For a collection of photos of the event see: PHOTOS. Credits: Duilio Farina (IIT). 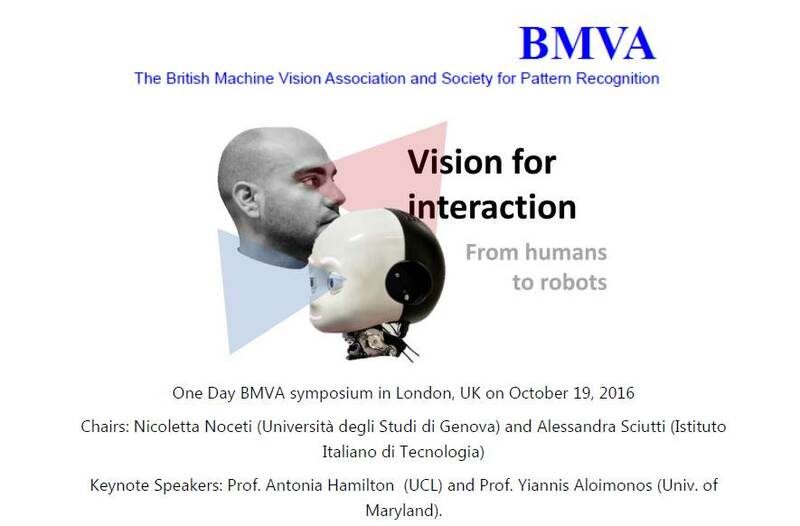 The purpose of the meeting will be two-fold: on the one hand the discussion will focus on how the development of human visual perception might inspire the development of novel methods for artificial vision and social robotics; on the other hand, it will evaluate how the implementation of machine vision methods could help understanding human social development. 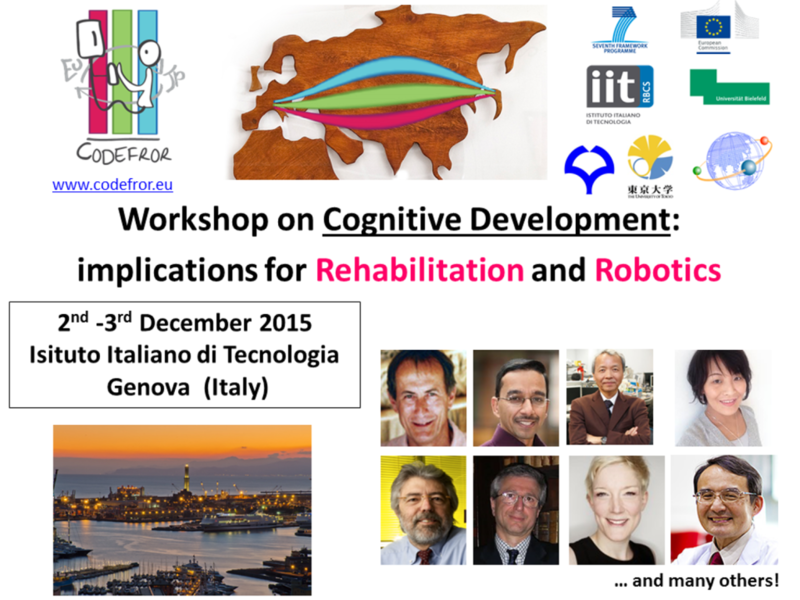 We are glad to invite you to a two-days workshop on human cognitive development and its implications for Robotics and Rehabilitation at the Italian Institute of Technology in Genoa, Italy. International speakers coming from a variety of scientific fields will present their most recent research with particular focus on a constructive approach to the investigation of cognition (“understanding-by-building”). 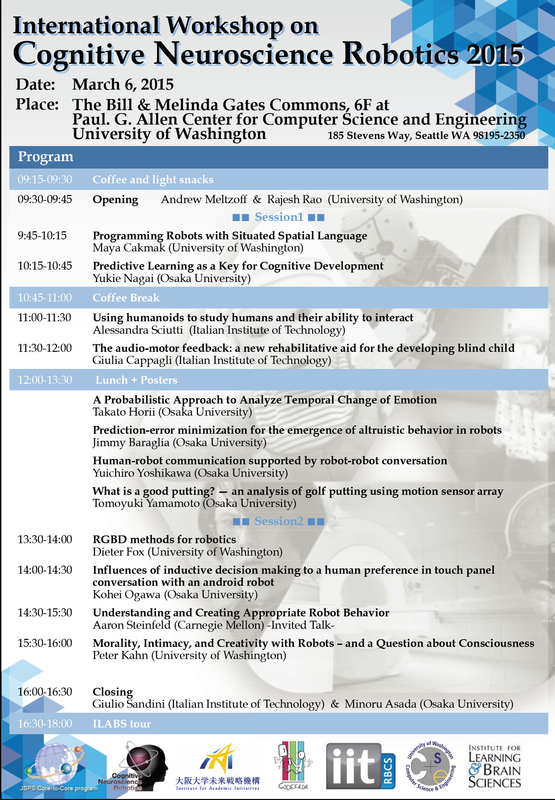 The program of the workshop (see below) consists of two days of oral presentations by invited speakers spanning from cognitive robotics , human cognition, human robot interaction, robotic and sensory rehabilitation, prosthesis, surgical robotics, computational neuroscience. Moreover, the impact of research and technological solutions on social needs and, more specifically, on rehabilitation and support of persons with disabilities will be central to the workshop. The participation in the workshop is free of charge, but it requires a registration for organizational purposes. If you are interested in presenting your work at the poster session, please specify it in the form. 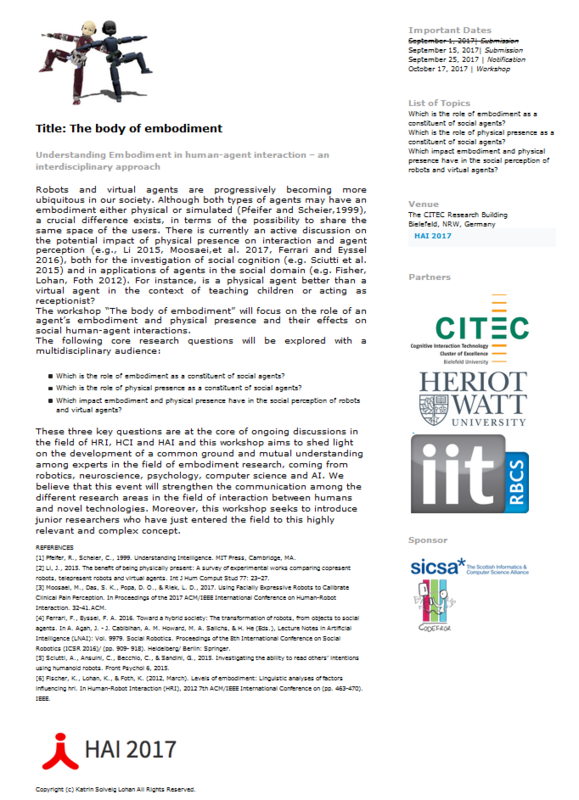 You will be required to provide a title and short abstract (300 words) before the 25th of November. You will be notified of poster acceptance soon after. 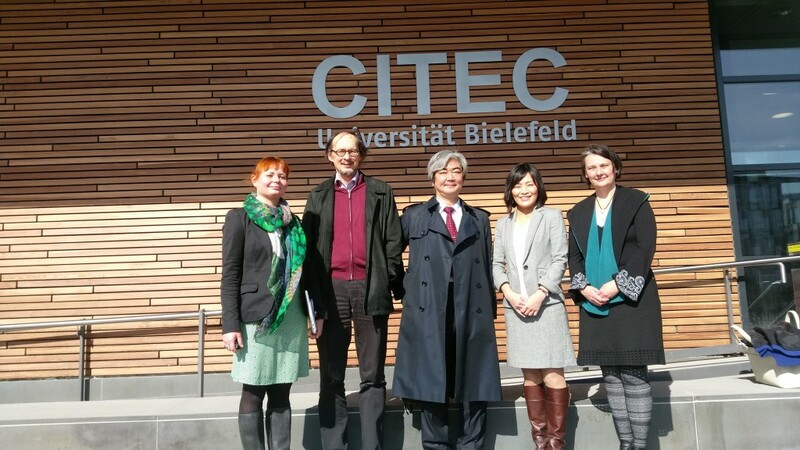 Pictures of the event by Professor Tomoyuki Yamamoto. A key feature of humans is the ability to entertain models of other agents, to anticipate what they are going to do and to plan accordingly a collaborative action. Analogously the focus of cognitive robotics is on predictive capabilities: being able to view the world from someone else’s perspective, a cognitive robot can anticipate that person’s intended actions and needs. Hence, a fundamental aspect of cognition, both natural and artificial, is about anticipating the need for action and developing the capacity to predict the outcome of those actions. But how does this capability develop in humans and how can it be developed in robots? The goal of this symposium is to address these questions by investigating aspects of cognitive development through the development of cognitive robots. The discussion will focus on what is a cognitive architecture, on how predictive learning could lead to social cognition, and how bio-inspired cognitive architectures in robotics could prove fundamental for (physical) interaction. The session will start with an overview on artificial cognitive architectures by Professor David Vernon (University of Skövde), followed by talks on different aspects of cognitive robotics with a focus on learning and development by selected speakers as Professor Yukie Nagai (Osaka University) and Professor Jochen Steil (Bielefeld University). 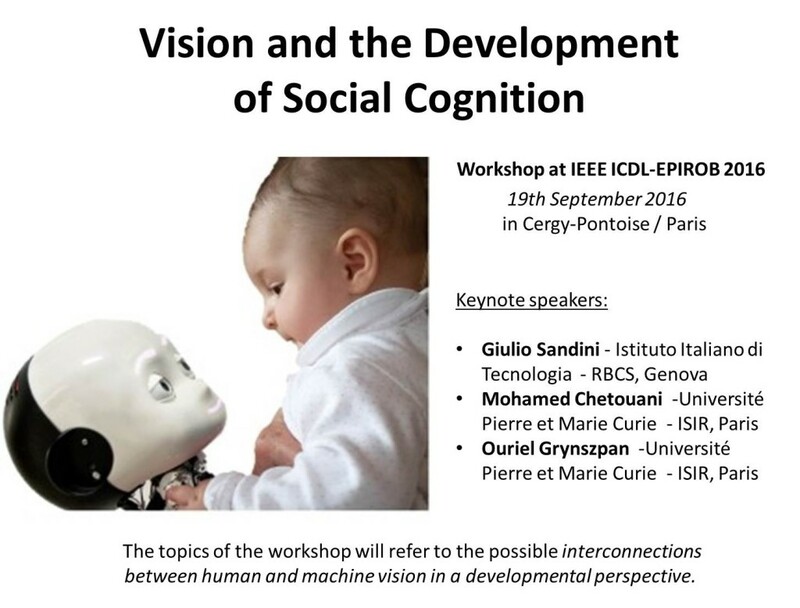 Professor Giulio Sandini (Istituto Italiano di Tecnologia) and Professor Minoru Asada (Osaka University) will chair the session providing an introduction and a link between the different perspectives of developmental cognitive robotics and discussing its relevance for a multidisciplinary understanding of cognition. Have a look at some photos of the event on the Media page! 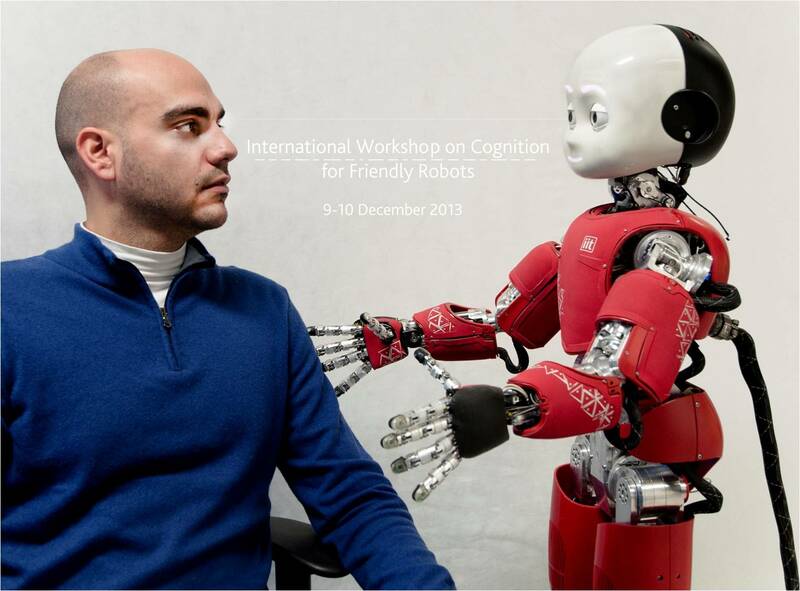 Cognition: A Bridge between Robotics and Interaction. A key feature of humans is the ability to anticipate what other agents are going to do and to plan accordingly a collaborative action. This skill, derived from being able to entertain models of other agents, allows for the compensation for intrinsic delays of human motor control and is a primary support to allow for efficient and fluid interaction. Moreover, the awareness that other humans are cognitive agents who combine sensory perception with internal models of the environment and others, enables easier mutual understanding and coordination. Cognition represents therefore an ideal link between different disciplines, as the field of Robotics and that of Interaction studies, performed by neuroscientists and psychologists. From a robotics perspective, the study of cognition is aimed at implementing cognitive architectures leading to efficient interaction with the environment and other agents. From the perspective of the human disciplines, robots could represent an ideal stimulus to study which are the fundamental robot properties necessary to make it perceived as a cognitive agent, enabling natural human-robot interaction. Ideally, the implementation of cognitive architectures may raise new interesting questions for psychologists, and the behavioral and neuroscientific results of the human-robot interaction studies could validate or give new inputs for robotics engineers. 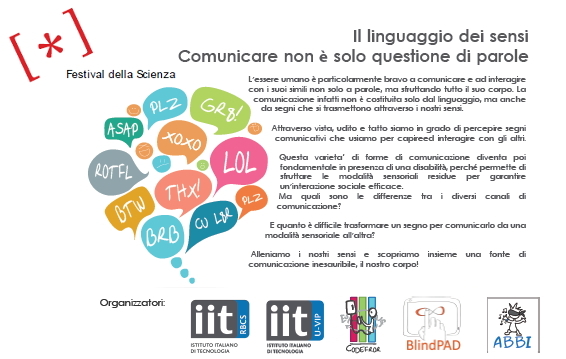 The aim of this workshop will be to provide a venue for researchers of different disciplines to discuss the possible points of contact and to highlight the issues and the advantages of bridging different fields for the study of cognition for interaction. For the detailed program please check the official website. 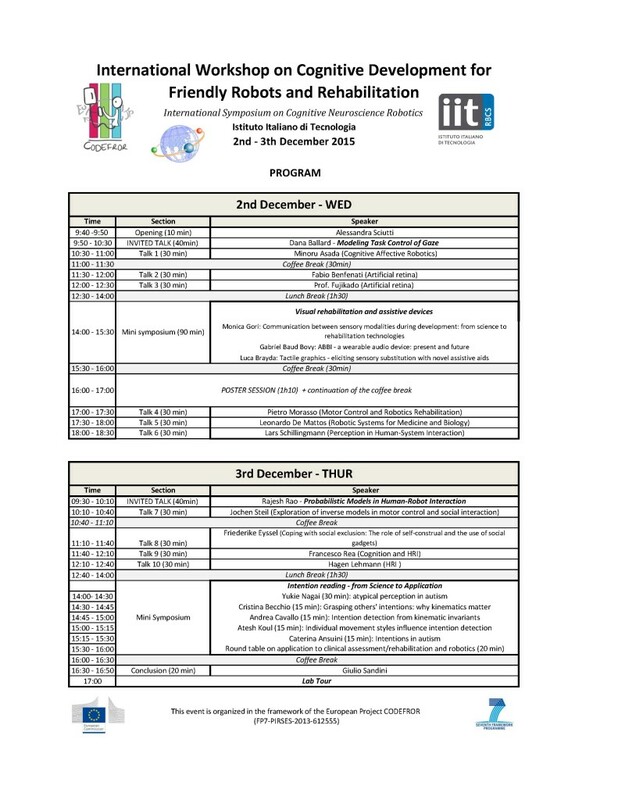 An International Symposium on Cognitive Neuroscience Robotics will be held in Osaka University on December 11th 2014, to foster innovative joint projects. 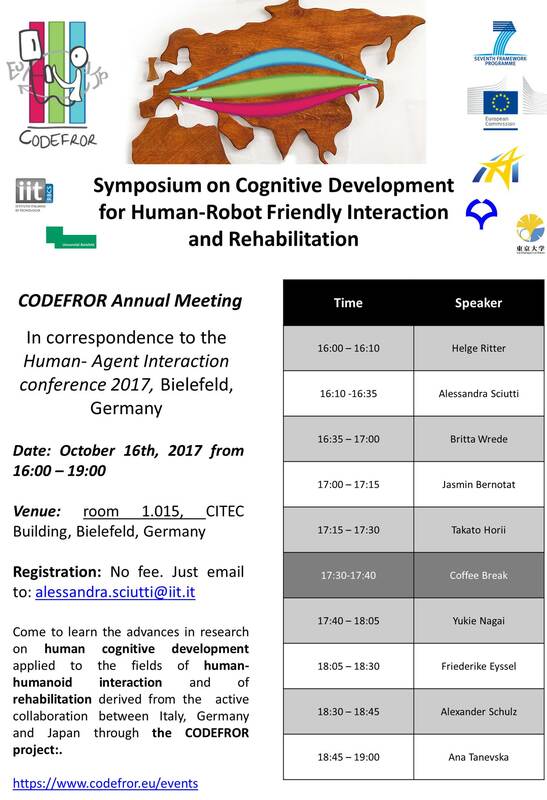 A series of workshops on relevant topics for CODEFROR (as Robotics, Cognitive Science and Neuroscience) will be held in the previous days. All partners of the CODEFROR project will present their results. For the detailed program please check the official website . In occasion of the fourth joint IEEE International Conference on Development and Learning (ICDL) and Epigenetic Robotics (EpiRob) held in Genoa (Italy), CODEFROR members had the occasion to meet on the 14th October 2014 to share their previous experiences and plan the future exchanges. 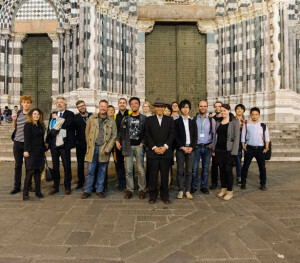 You can find here some pictures of the social event by Prof. Tomoyuki Yamamoto. A fundamental challenge for robotics is to transfer the human natural social skills to the interaction with a robot. At the same time, neuroscience and psychology are still investigating the mechanisms behind the development of human-human interaction. HRI becomes therefore an ideal contact point for these different disciplines, as the robot can join these two research streams by serving different roles. From a robotics perspective, the study of interaction is used to implement cognitive architectures and develop cognitive models, which can then be tested in real world environments. From a neuroscientific perspective, robots could represent an ideal stimulus to establish an interaction with human partners in a controlled manner and make it possible studying quantitatively the behavioral and neural underpinnings of both cognitive and physical interaction. Ideally, the integration of these two approaches could lead to a positive loop: the implementation of new cognitive architectures may raise new interesting questions for neuroscientists, and the behavioral and neuroscientific results of the humanrobot interaction studies could validate or give new inputs for robotics engineers. However, the integration of two different disciplines is always difficult, as often even similar goals are masked by difference in language or methodologies across fields. The aim of this workshop will be to provide a venue for researchers of different disciplines to discuss and present the possible point of contacts, to address the issues and highlight the advantages of bridging the two disciplines in the context of the study of interaction. A collection of photos of the two previous events can be found here! On 9 and 10 December 2013 researcher from Osaka University, University of Washington and Bielefeld University convened in Genoa to discuss how to build Cognition for Friendly Robots with IIT researches. During the workshop several topics have been debated, including development, robotics, social interaction, rehabilitation and BMI. 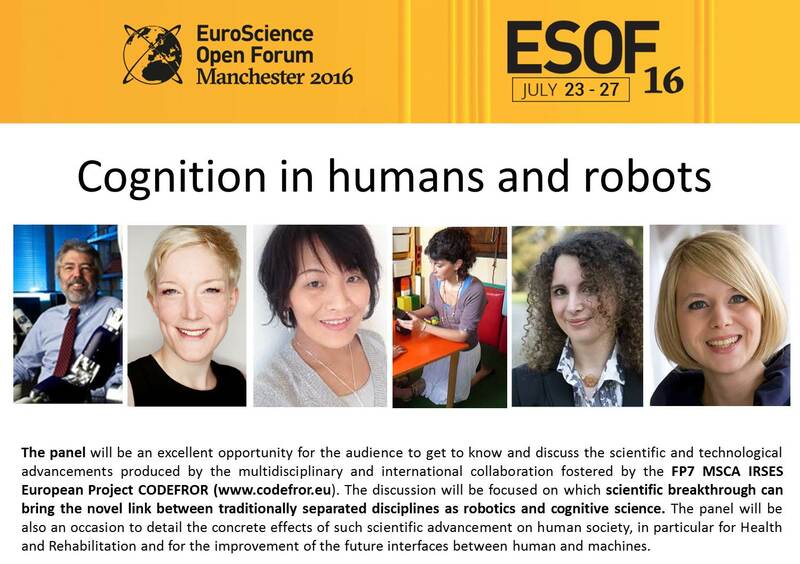 Future collaborations are planned, in the framework of the exchange Core-to-Core Program: “Competitive Partnership on Cognitive Neuroscience Robotics” , funded by the Japan Society for the Promotion of Science (JSPS) and of the FP7-PEOPLE-2013-IRSES exchange program “CODEFROR” funded by the European Commission, which will start on February 2014. Photos of the events can be found here and here.